This is the third of four articles that outlines the Clubb Chimera approach. Regardless of your chosen path, I think that Jamie's methodology has a great deal to offer all martial artists and that these articles will be very useful in getting people to analyse their own training and methods. I'm very grateful to Jamie for continuing to share his knowledge with members and visitors to this site. In CCMA common sense is accepted in simple terms as a combination of intuition and decisions drawn from obvious data. These lead to the formulation of basic natural principles that will lead to the development of efficient strategies. Whereas the common sense and principles parts of the CCMA process are a mixture of non-physical skills and physical skills, the strategies section is completely physical. To keep things simple and generic I found that there were two basic strategies in combat. These strategies do overlap, but I found that most martial arts orientate towards either one. Strategy One is the strategy of maintaining distance. It is the priority strategy. The tactics of Strategy One include escape, the fence, striking, pushing and using anything that maintains a gap between you and your attacker. As previously discussed in The Principles article, the drive to escape in the face of adversity is an incredibly strong instinct in animals. Therefore it makes sense that Strategy One comes first. This tactic is always the goal even if you employ tactics that completely neutralize your attacker. If you do not have escape in mind then you are in danger of being drawn into an alpha male contest, which is the last thing you want to consider in a fight for your life. Escape, it should also be remembered, does just mean running away, but also de-escalating or using your voice to prevent a situation from becoming physical. The concept of what Geoff Thompson terms “The Fence” is also a very natural tactic for controlling distance and gauging when an attack is going to become physical. 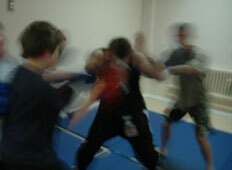 Striking, when performed correctly, is an immediate attacking method that can end a fight before it has really begun. It also is good for maintaining distance. Pushing is also a good method to creating space in order to use other attacking or escaping methods. Martial arts that orientate themselves towards Strategy One includes Muay Thai, Western Boxing, Karate, the most popular Chinese disciplines and essentially the strike-based fighting systems. Having said that, no one system is pure Strategy One, despite the ideal, unless we count Parkour, an art derived from escape, which I discussed in my previous article. Even Western Boxing, if we dismiss its pre-twentieth century roots that included grappling techniques, teaches tactics to close the distance and who can forget some of the great boxers who based their entire game on fighting an opponent's guard. Strategy Two is the strategy of closing distance. It is a supporting strategy, a “plan b”, if you like, and should only been seen as transitional in order to gain or regain Strategy One. A good question here might be if we are talking about survival in a civilian environment why would someone want to close the distance? Well, the answer is that sometimes things go really wrong. When you are overwhelmed by strikes, particularly to the head, the most natural reaction is to cover and smother. Covering is a particularly natural instinct and can be utilized into an effective reactive tactic. It works efficiently because although it is employed as a reaction, when someone has already initiated the physical attack, it provides a means for recovery whilst put you on the front foot straight away. I will discuss this more in depth in the tactics article that will follow. Grappling is the most natural and quite probably the most ancient form of unarmed fighting developed by primates. We are naturally tool-using animals, so striking is normally geared towards these actions hence the reason why, as anthropologist Desmond Morris pointed out in his “Manwatching”, the first strike a human does is a looping downward swing as if wielding a club. Children do this all the time, even when they are babies. This is also the way all the other great apes strike in conjunction with using their teeth and, of course, grappling. Grappling is common between humans as a form of fighting because it is a method that can test athleticism between two males without incurring serious injury. Security experts like Sgt. Rory Miller argue that this is an inbuilt species preservation instinct. Within a tribe males compete as the main breeder, the strongest male needs to defeat all his rivals, but he doesn't want to kill them less he has no tribe. With this in mind, although grappling does contain some extremely dangerous techniques, such as rear chokes and strangles, which can kill, it should only be considered be transitional in a real self-defence situation. It is a great method for positioning in order to operate Strategy One tactics. Martial arts and fighting systems that orientate themselves towards Strategy Two are Wrestling, Judo, Keysi Fighting System, Brazilian Jiu Jitsu and Submission Grappling. The great thing about just having strategies is that when you isolate a particular area you get a well-rounded approach. For example a whole set of our drills are known as Strategy One versus Strategy Two, which immediately helps students appreciate how to develop their tactics when a certain strategy is completely blocked off. For example, Strategy One immediately understands the importance of running or striking early and the problems associated with striking from positions that are advantageous to a grappler. The Strategy Twos learn to cover distance and absorb punishment. Strategy One versus Strategy Two one-on-one sparring pretty much pits grappling against striking. The dynamic, however, changes completely with multiple fighting. This can begin with Strategy One students doing their best to evade and fend off the grapplers, who don full-face head-guards or head-cages and try to drag them to the ground or pull them back to a certain spot. The game can also begin from a “code white” position whereby all the Strategy Ones have their eyes closed until they sense the attack or hear something. This game can be further varied with a pre-fight section, which we sometimes call “predator and prey”, where the Strategy One students mingle with the Strategy Two students, as they all walk around the mat. The Strategy Ones know they are being stalked and adopt methods that will best protect them. They are not allowed to leave the mat, so some form groups and all learn to become more aware or sensitive to their environment. Meanwhile the Strategy Twos start getting into the mind of the attacker and see through the eyes of a predator. 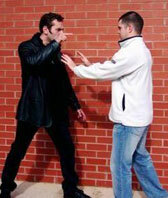 Having this type of understanding helps them to become better prepared in their self-defence mindset. Upon a secret signal the Strategy Twos then attack and the game is the same as before. The strategies are then mixed, but another restriction is implemented – multiple attackers. These various drills quickly bring out the importance of escape, the benefit of being able to cover, use aggression, striking and pushing whenever possible and not getting drawn into a match fight. The strategies are utilized as they would be in the street – you opt for Strategy One whenever you can, you opt for Strategy Two when you have no other choice. Weapon training also brings the same points into focus. In fact, whenever the odds become stacked above the normal odds of a consensual bout, the strategy system becomes blatantly obvious. 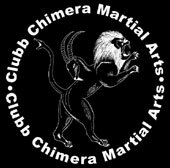 Clubb Chimera Martial Arts is a post-“Reality Revolution” method. I am one of many instructors who had their views on the martial arts and self-defence influenced more by people like Geoff Thompson, Mo Teague, Peter Consterdine, Dennis Jones, Matty Evans, Tony Somers and so on, than I did by the more formal systems. Instructors like these ushered in various concepts that were directed related to modern self-defence in a manner that hadn't been properly addressed on a mainstream level since the World War II combatives era. I believe they are more responsible for encouraging a more well-rounded approach to combat and as well as more interest in actual strategies and tactics rather than the clean-cut structures of pattern work. It was for this reason that I really understood why I needed a changeable system that nevertheless stuck to core principles. Out of those generic principles I had to formulate strategies that were just as broad and pragmatic. If we are to intelligently cross-train then we need to have some focused and well-defined objectives. The strategies do just that. One of the greatest problems with martial arts, in addition to constantly adding techniques without substance, is to fixate on a certain area without considering the whole picture. By dividing everything up into two strategies the student keeps his mind on exactly what he is training towards.